On Friday 20th November 2015, members of the SHLD group attended the launch of the film of Mabel Cooper’s life, ‘No Longer Shut Up’. The event was hosted by Access All Areas, an inclusive theatre group who produced the film. It was held in the Barbican, London, a venue that held special meaning for Mabel and her friends. Mabel Cooper was a truly inspiring woman, who was a key figure in the SHLD group and a self-advocate who made waves across the world. She championed the rights of people with learning disabilities, and was determined that others should not have to endure what she had experienced, incarcerated at St Lawrence’s Hospital, Catheram, for 20 years. In her words, people with learning disabilities should never again be ‘shut up’. She was passionate about the power of research and education to help society change, and upon her release from the institution in the 1970s, Mabel worked tirelessly to share her own story and advocate through People First. Mabel had never known why she had been placed in an institution, and it was only through very careful archival work with her friend Dorothy Atkinson, that she was able to track down her notes and piece the story together. Mabel discovered that her own mother had been on the streets and unable to care for her. Her mother was put in an institution and they never met again. After a series of moves around various children’s homes, Mabel was assigned the label of ‘feeble-minded’ and was transferred to St Lawrence’s as a teenager, which she found terrifying. While the trauma of those years never left her, Mabel embraced life in the community. She learned how to read and to travel independently, supported by her long-term friend, and fellow resident at St Lawrence’s, Gloria Ferris. Mabel gradually found the confidence to speak out about her experiences, presenting at academic conferences, and visiting schools to talk to young people. She was quite clear that real change could only occur when the hearts and minds of the next generation had been won. Mabel sadly died in 2013. Very generously, she left some money to help continue her work. Mabel requested that her long-term supporter Jane Abraham and the SHLD group at the OU come up with a plan to support her legacy. After much thought, we decided to use the funds to make a film of Mabel’s life that could be accessed by everyone. Access all Areas were commissioned to make the film, and people with learning disabilities were employed as actors on the project. It is a powerful piece, and can be viewed on YouTube. 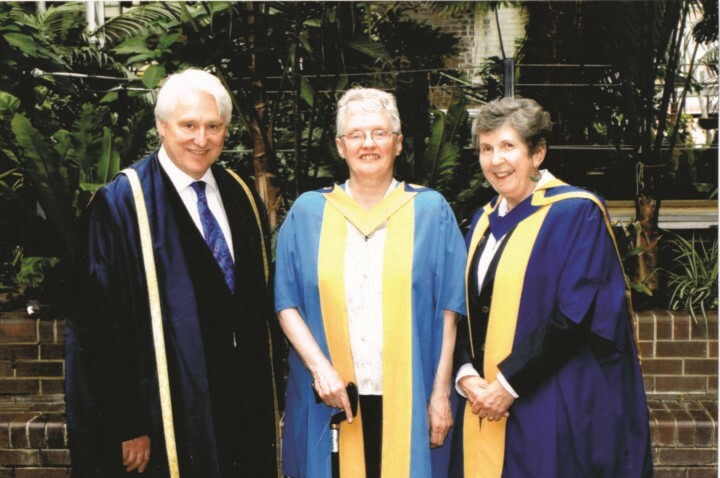 It was terrific that the film premiered at the Barbican because that was where, in 2010, Mabel was awarded an Honorary Degree by the Open University for her services to the community, and for the unique contribution she made to the OU’s Social History of Learning Disability Group. We all miss Mabel greatly and our annual SHLD conferences are not the same without her. She was an amazing advocate for the social history of learning disability, for inclusive research and for using life stories to inspire change. She was forthright and didn’t pull any punches! But she was also warm, funny and caring, and always helped others whenever she could. “The fact that Mabel’s launch was in the same week as the All Party Parliamentary Group on Learning Disability discussed Transforming Care, the challenge of bringing the 3000 or so people in institutions back to their communities, reminds us that her work is not finished. And maybe she is right, we really must start telling young people about this Hidden History, those Forgotten Lives, and reassert her determination, to be No Longer Shut Up”. This entry was posted in Info, Reflections and tagged Access All Areas, film, life story, liz tilley, Mabel Cooper, No Longer Shut Up, SHLD by admin. Bookmark the permalink.